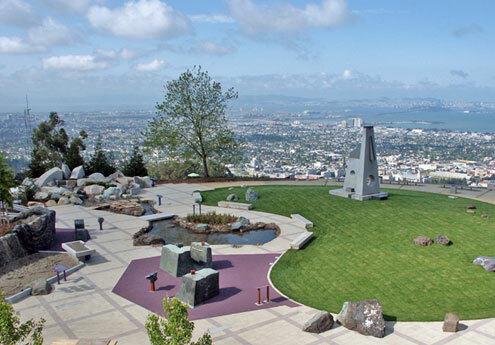 Forces That Shape the Bay Lawrence Hall of Science « Jeff Kennedy Associates, Inc.
Set 1,100 feet above San Francisco Bay on the campus of UC Berkeley, Forces That Shape the Bay focuses visitors’ attention on what lays directly before them—a landscape shaped and changed by forces still at work today. JKA worked in close collaboration with landscape designer Ken Kay and the staff of LHS to develop and design an exhibition that would allow visitors to participate in full-body and hands-on activities that show how the Bay was formed and to contemplate the result of millions of years of change wrought by geologic, climatic, marine, and human forces. 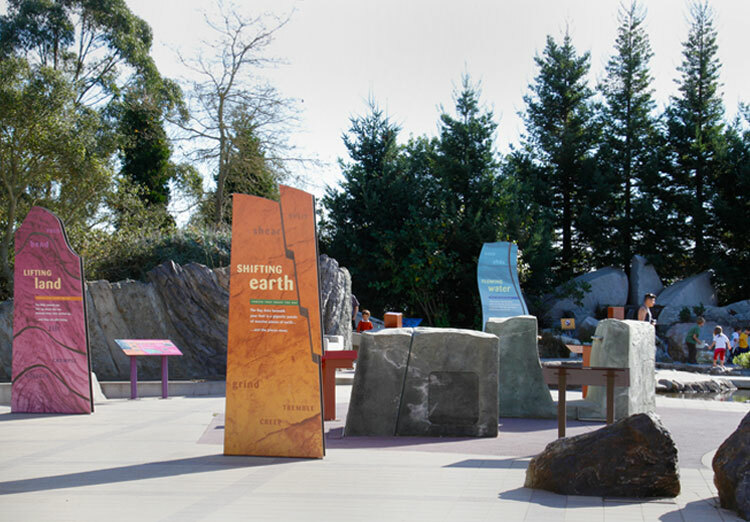 Integrating the design of landscape and exhibits created an interpretive experience on a large scale appropriate for an outdoor setting. With a world-class vista overlooking San Francisco Bay, the park-like environment and exhibits bring an entirely new aesthetic and educational dimension to a Lawrence Hall of Science visit. 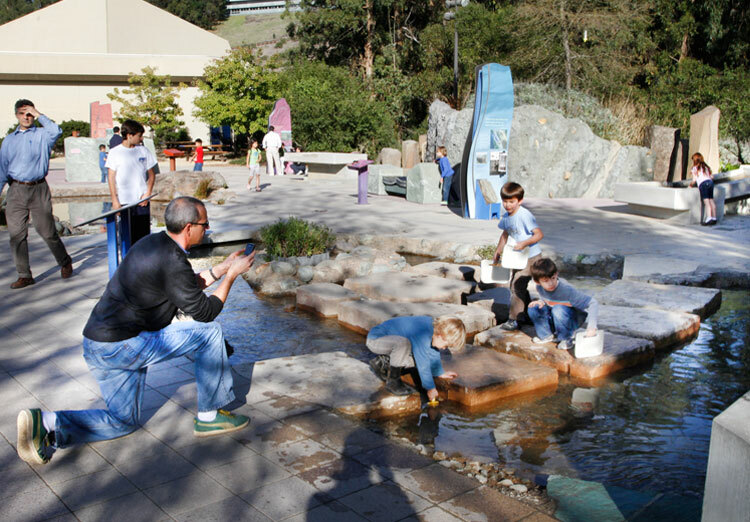 Forces shaping the bay interpreted through exhibits and activities include mountain building in Lifting the Land; earthquakes & plate tectonics in Shifting Earth; and, in Flowing Water, the power of water as it runs from mountains down into the bay. 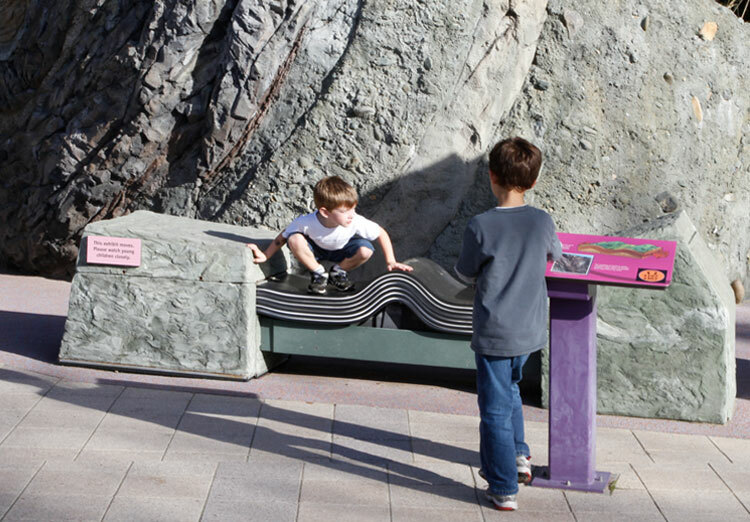 Geologic forces that compress the earth and create uplifted mountains like the nearby Santa Cruz range are interpreted in Compression Bench. The bench is made of multiple layers of thick rubber. When a button is pushed, one end of the bench slowly begins to move in, forcing a mountain-like form to rise up in the middle. After approximately 12 inches of travel, the bench stops briefly, and then slowly returns to its starting position with the rubber once again laying flat. 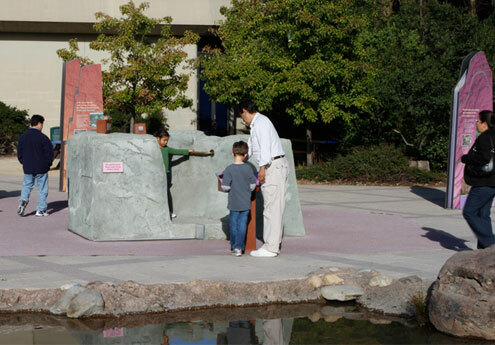 Another full-body activity enjoyed especially by younger visitors is riding on a slip fault as two large faux-stone slabs shudder and shake, sliding by one another in a simulation of the side-by-side ‘strike slip’ movement of tectonic plates that happens during an earthquake that involves the area’s famous San Andreas Fault. A large water feature at one end of the site includes of group of massive stepping stones. Slots are provided so that visitors can experiment with water flow by creating dams with rigid pieces of plastic. 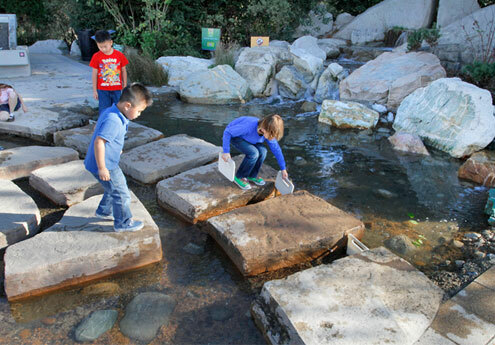 Erosion tables provide open-ended experimentation beds at which visitors can investigate the power of flowing water. Two large side-by-side tables are set at substantially different angles, offering an opportunity for comparison of how patterns of erosion differ. The strategic goal underlying the development of this exciting new part of Lawrence Hall of Science was to attract families with younger children. 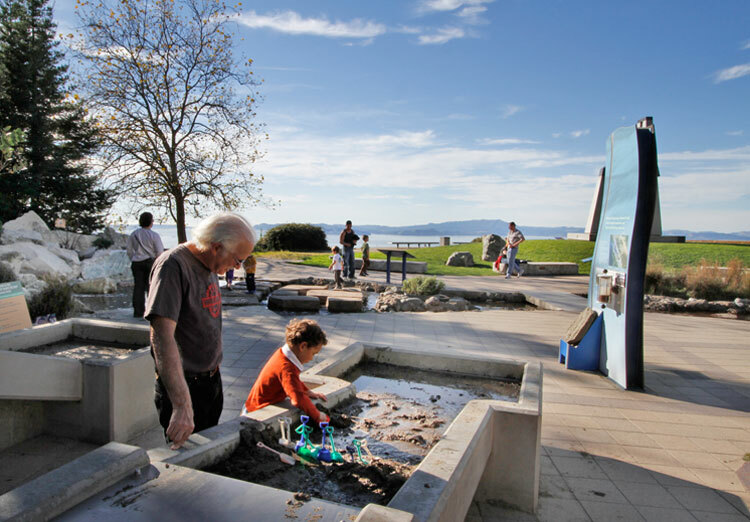 For this age group, the full-body activities, spaces to run and play, and water and sand to manipulate provide a fun, and highly repeatable, family outing.